I went to the market today and saw the year’s first poppies for sale. I couldn’t resist. I had to buy a bouquet. For me they symbolize the essence of summer with their mesmerizing delicate beauty. They are almost as intoxicating to look at as it is to drink a glass of good wine. They just make me feel so happy. 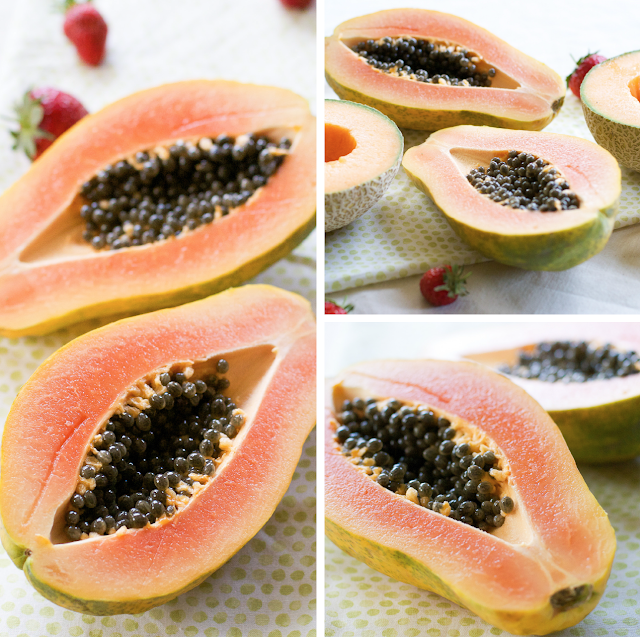 And if I talk about my love for poppies, I also have to talk about my love for papayas. 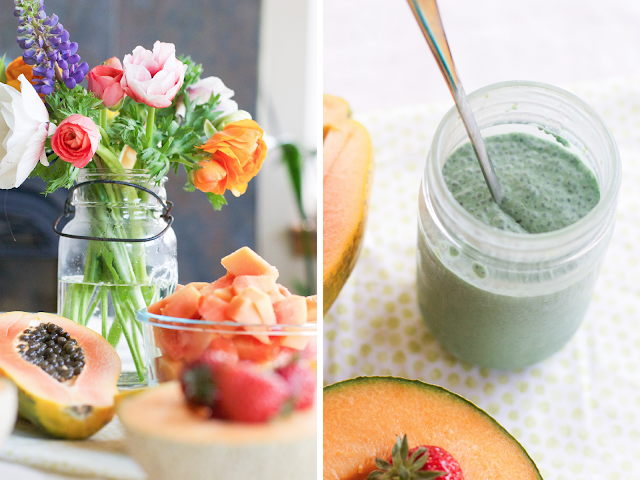 As you may have guessed POPPIES and PAPAYAS are hands down two of my favorite things in this world. 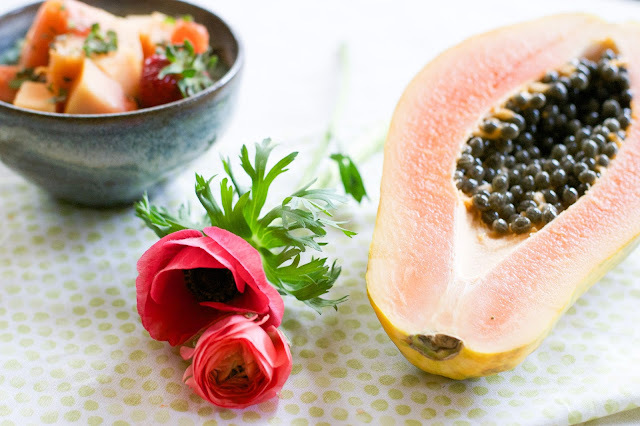 As much as I am mesmerized by the beauty of the poppy, I am enthusiastic about the musky flavor, vivid sunset color, and unique properties of the papaya. There truly is nothing else quite like it. There are many ways to eat papayas. 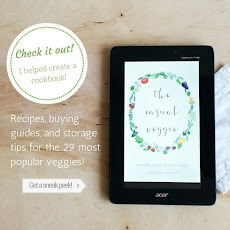 Recipes can be very simple or a little more complex. Have you tried diced papaya with a squeeze of lime? Absolutely delicious! 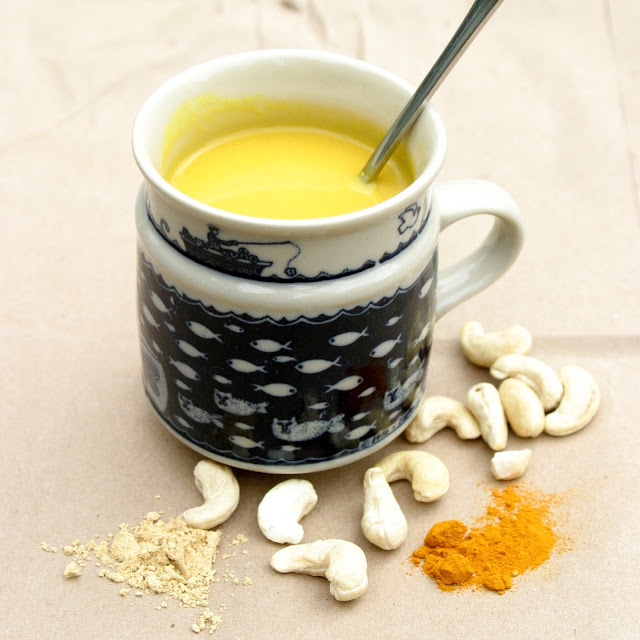 Or blended together with ginger and turmeric in a Balian Smoothie? So refreshing! And what about a savory green papaya salad? One word…YUM! You can even make papaya breakfast boats, filled with your favorite yogurt and fruit topping. 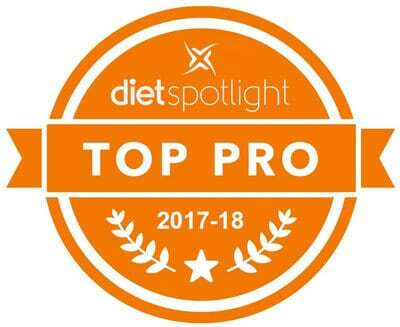 Rich in vitamins A and C, this fruit is an antioxidant powerhouse, which can be especially helpful for those struggling with chronic inflammation. Although it doesn’t taste sour, 1 cup alone provides over 200% of your daily vitamin C. Feeling like your immune system is low?? 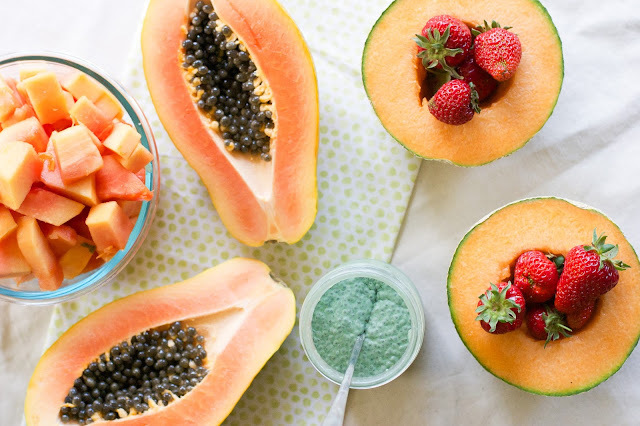 Then reach for papaya instead of Emergen-C. Plus the vitamin A will help keep your skin looking and feeling great! But what really sets the papaya apart from other fruits, is that it contains a very unique enzyme called papain, which helps digest proteins. 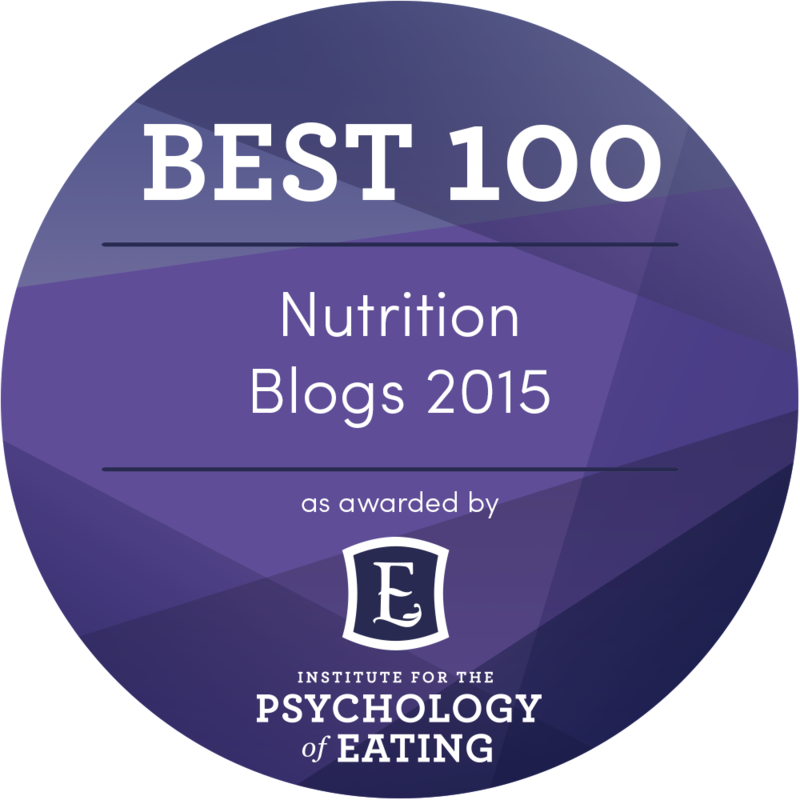 Have you ever purchased digestive enzymes?? Well, they probably contained papain from papaya!! 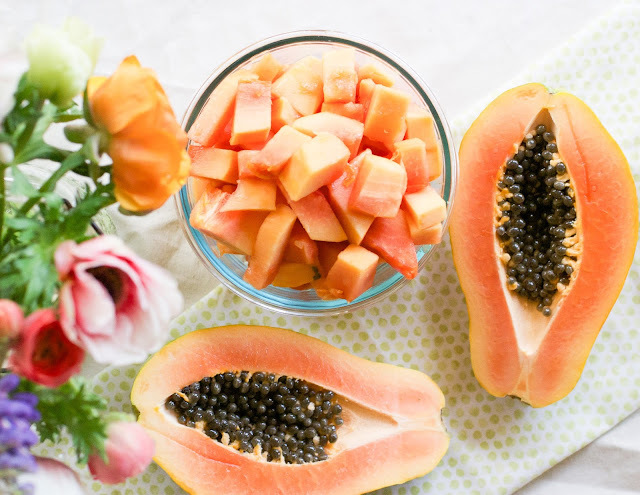 This enzyme is more concentrated in green and unripe papayas (which are great for green papaya salad) but you will also get papain if you eat a ripe papaya. So next time you have a protein heavy meal, have a little papaya on the side. 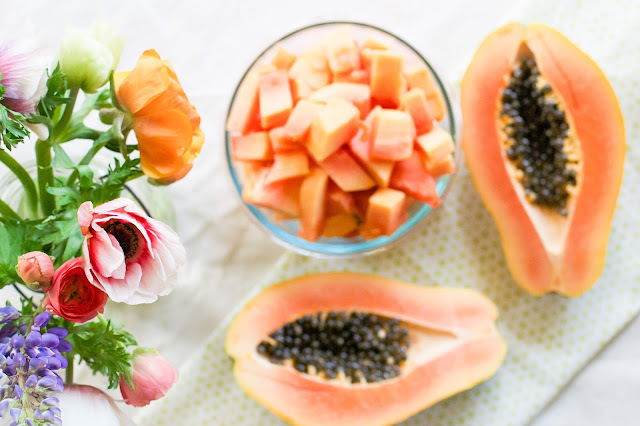 Plus research has also found that the enzymes in papaya, papain and chymopapain, can help reduce inflammation in people struggling with inflammatory conditions such as arthritis. 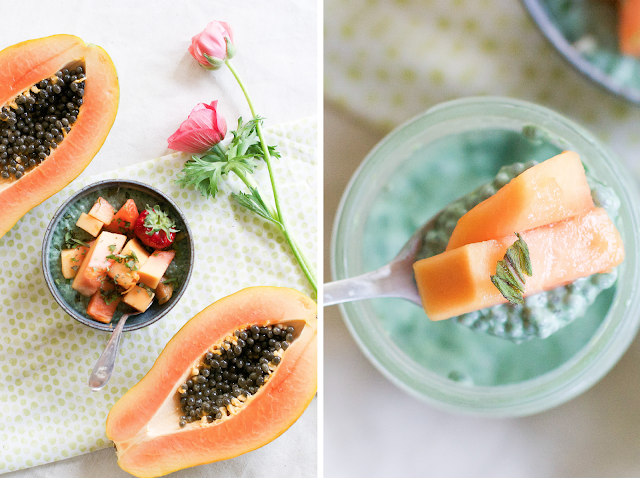 Today I will highlight the papaya as a simple topping to a delicious chia pudding. 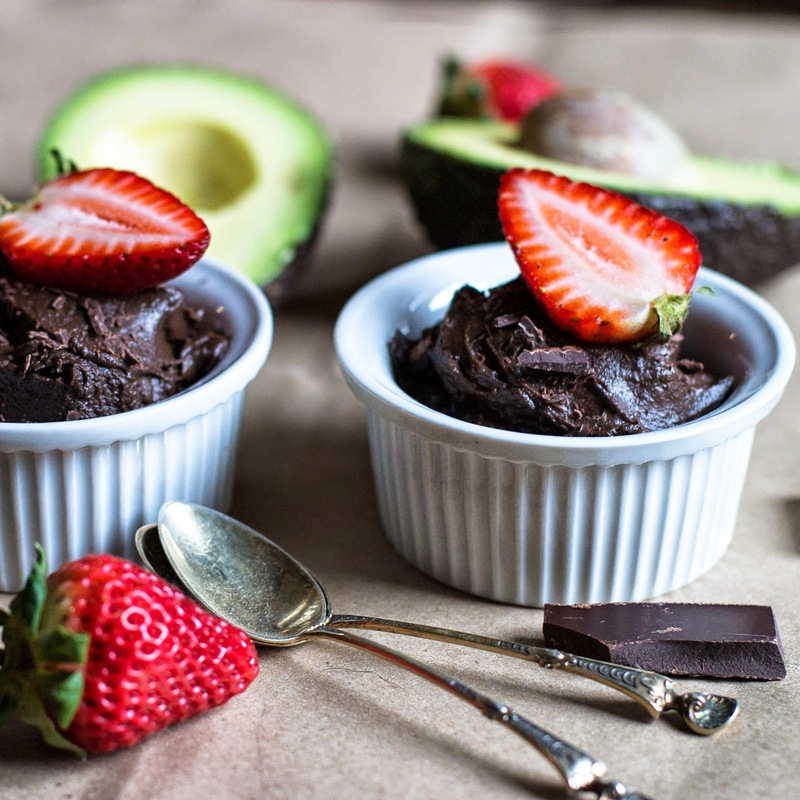 This treat can be a light breakfast, simple dessert, or quick snack. When it’s hot out…this totally hits the spot. So bring on the summer and bring on the GLOW, because this recipe will make you feel soooooo gooooood from the inside out! 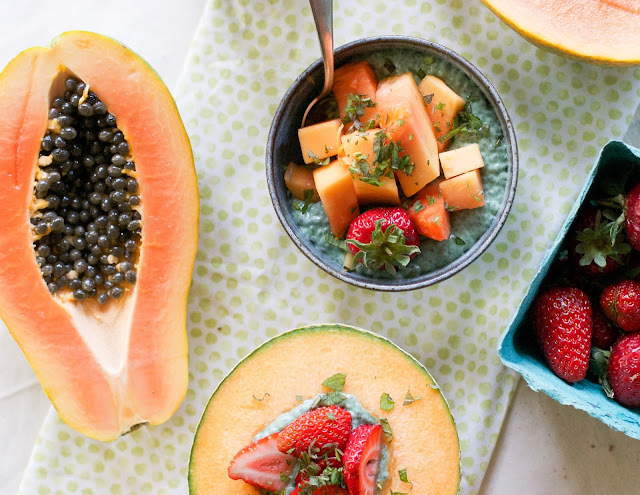 In this recipe papaya is paired with the best of the best...spirulina, chia seeds, and coconut milk. Plus I like to add in hydrolyzed collagen and probiotic powder to increase the GLOW factor of this recipe. The hydrolyzed collagen supports skin and joint health, while the probiotic powder provides all the good bacteria to support your gut health. So along with the chia seeds (a source of soluble fiber which feeds the good bacteria), full fat coconut milk (which helps absorb fat soluble vitamin A), and the spirulina (which supports detoxification), we got a super tasty and super healthy treat. Oh and the lemon zest and fresh mint, just add the extra ZING that makes this UBER delicious. So are you ready?? Here you go!! In a medium bowl add the nut milk, coconut milk, vanilla, spirulina, maple syrup, lemon zest, and sea salt. Whisk until combined and the spirulina is dissolved (some of the spirulina will remain in little clumps..that is okay it will dissolve over time). Add the chia seeds, optional collagen/probiotic powder, and whisk some more. Pour into an airtight container and store in the refrigerator overnight or at least 8 hours to allow the chia seeds to plump up. Alternatively, you can add all the ingredients into a mason jar, screw the lid on tight, and shake vigorously for a minute or two. Note: you may need to stir or shake the chia pudding one or twice while it sits for the 8-12 hours so that the chia seeds are evenly dispersed. 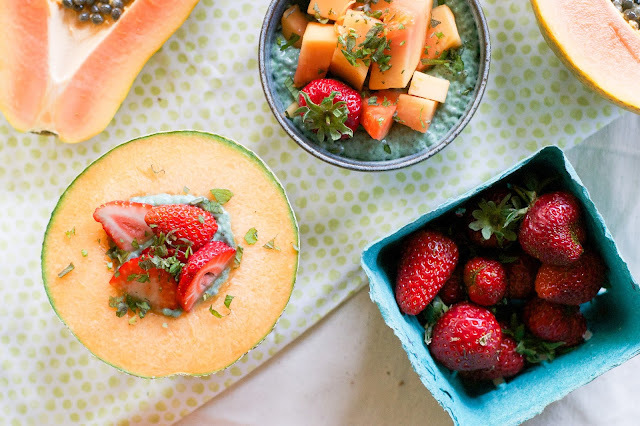 To serve divide the chia seed mixture into bowls (or into small melons), and top with PAPAYA (or your fruit of choice), and a sprinkle of fresh mint. Sometimes I add a little extra coconut drizzle for extra creaminess.